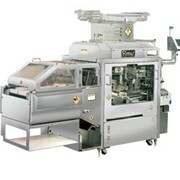 From prepared foods to confectioneries, Rheon Encrusting Machines are applicable to a wide variety of foods. Rheon products are now found in meat and poultry, snack and health, seafoods, confectionery, pet food and even ice cream as well as bakery products including biscuits/cookies as well as bread doughs. The basic concept of the Rheon machines are to combine any two materials - one as an outside casing and the second as a filling. The machine extrudes the two materials as a continuous extrusion and a shutter device, not unlike a camera iris, cuts and seals the extrusion to the desired weights and/or lengths. Primary shapes from the machine are obtained as balls from 10 to 300gms, OR logs (closed and sealed rounded ends) of any weight depending how long the log is, OR use the machine to make a continuous extrusion and cut into lengths downstream to the required weights/lengths (these will give you open ends where you can see the filling contents such as a sausage roll or fruit bar). The ability to deliberately leave the top of a ball product open by using a special shutter. This allows the filling to be seen. 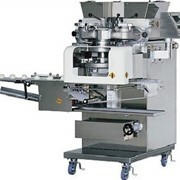 This was developed primarily for producing individual portion pizzas but will find other applications as well. The ability to use different shaped ring and nozzle sets so as to have other than round continuous extrusions or logs. They can be square, triangular or almost any shape including open topped where the filling is a layer on the second material (casing) rather than be enclosed by it. The ability to make the filling into pictures or mosaics. This is primarily used for biscuits where teddy bears or smiley faces can be produced with two different coloured (and flavoured) biscuit doughs. The ability to add a second filling into the centre. The second filling (or third material) must be of a paste or thick liquid type nature. An example may be to produce the round potato ball with a meat filling, and a dash of tomato sauce in the centre of the meat. The ability to place a solid object inside the case material, with or without a filling around it. This could be a sweet pastry, with chocolate filling and a strawberry in the centre. It may be an olive in the centre of a ball of meat. There are several models of encrusters but all work on the same principles. The model KN-550 arrived to replace the very popular KN400 in 2007. The KN-550 is the premier encrusting machine able to handle the widest range of products and being able to produce the widest range of sizes. 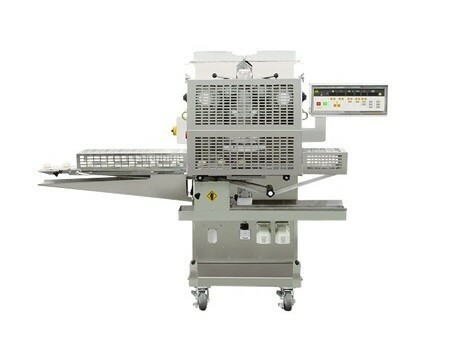 The KN135 is a smaller version of the now replaced KN400and although unable to handle elastic doughs, is fully suitable for most other savory and bakery products. 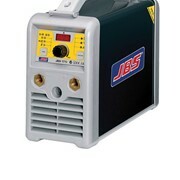 The KN550, KN400 and KN135 are of stainless steel construction and fully hoseable. 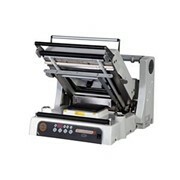 They each have a single head which can make up to a 300gram product as a single deposit (KN135 – up to 150gms). Both can handle a very wide range of materials. 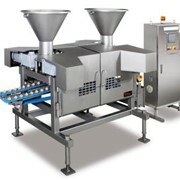 The KN170 is a lightweight version of the encrusting machines and is ideal for fast production of soft products such as confectionary, potato and cookie doughs. It has an aluminium construction and is not fully hoseable – it is therefore not generally suitable for meat and savoury products, although many companies still use them for potato and meat croquettes and filled gnocchi. For more information please call or use the IndustrySearch email form for a direct reply.